The National RF-B60L is the European version of the Panasonic RF-B60. 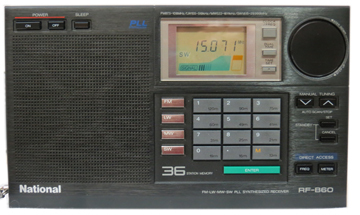 It covers 155 to 29999 kHz with a digital display and FM from 87.5-108 MHz. This double conversion receiver has great sensitivity and is big on features. You get keypad entry, 36 memories, S-meter, lock button, dual clock-timer with sleep (60 min. ), two speed manual tuning and up-down tuning. Fast tuning provides 5 kHz steps on shortwave and 9 or 10 kHz on medium wave. 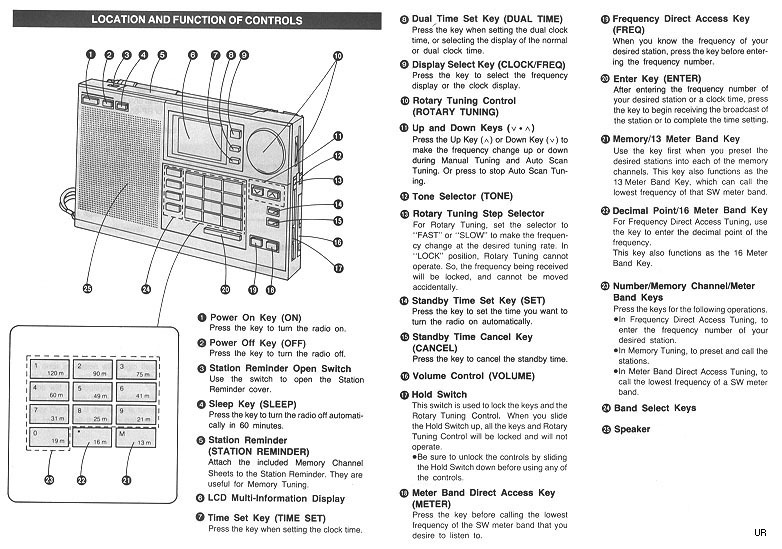 Slow tuning is 1 kHz on LW, MW and SW. All the receiver's controls are easy to use. There are external jacks for earphone (3.5mm mono 8 ohm), external antenna (3.5mm) and 6 VDC in. Operates from six AA cells. 8 x 4.675 x 1.3 inches 1.6 lbs. (198x118x34mm 650 g).